When I graduated in interpersonal communications, there was not a specific line of work for this degree; however, I felt inspired that this was the degree I needed to pursue. I married and had four beautiful children. As they grew we learned that three of them had a hereditary condition known as nonverbal learning disability. They didn’t read nonverbal communication very well, if at all, and this affected their overall communication skills. Our third child had the most difficulty. One day I was thinking back on my education and regretting my decision to not pursue nursing, as that could have helped with our challenges. I was sorry that I hadn’t used my degree for anything constructive to that point. It was then that the Spirit whispered very clearly to my mind that my degree was exactly what I needed to raise my children and that I had been using it every day as I helped them learn to communicate effectively. Gratitude filled my heart for the Lord’s tender mercy in preparing me to be the mother of these particular children before they were even born. Using the training she received from BYU, Merial Hawkins has re-created numerous articles of clothing from the 1800s. When my husband became involved in the hobby of restoring antique cars, I started collecting antique clothing from the 1800s so I could put on a fashion show telling the history of Relief Society for my ward. 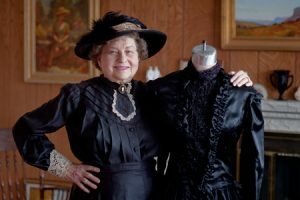 Clothes from this time period are hard to find and are too fragile and small to be worn, so I made accurate copies from pictures, using the skills I had learned in a pattern drafting and design class at BYU taught by Eleanor Jorgensen (BS ’46). I wanted examples of each major style change starting with the 1840s and ended up making 15 reproductions, including bustle dresses, a pigeon-breasted suit, a hobble skirt dress, and a Jean Harlow–style formal. During the next 25 years I gave close to 200 fashion shows, presenting them for Relief Society meetings, Young Women programs, and civic groups and even at the BYU 100th anniversary celebration, telling the history of each specific organization through clothing. I will always be grateful for what I learned at BYU. These rich experiences are a result of my natural ability that was honed into an art by an outstanding teacher, Miss Jorgensen. 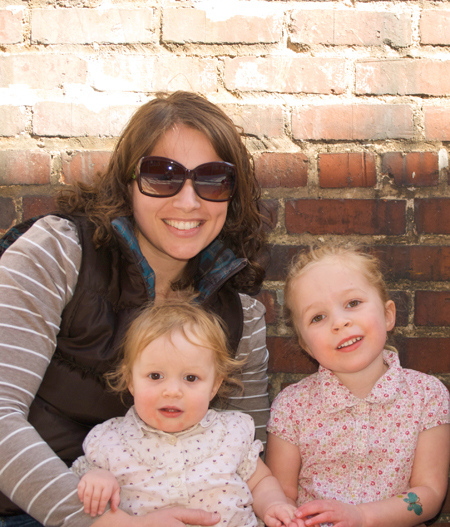 Katie Mildenhall keeps he rBYU foreign language skills strong by teaching them to her children. “I love you, Mom” are sweet words for any mother to hear, but for me, a former Italian major at BYU, I especially enjoy hearing the words “Mamma, ti voglio bene!” It still amazes me that my children are growing up bilingually—equally fluent in Italian and English. I didn’t want to lose the speaking skills I gained at BYU, so during my first pregnancy I began to research bilingual families. I decided that from day one I would speak only in Italian to my children, while my husband would speak in English. Three years later, I am thrilled when I hear my daughter rattle off a phrase to me in Italian and then turn and say the same thing to my husband in English. A special part of teaching my children Italian is singing Primary songs, holding family home evening, and reading the scriptures in Italian. I think that my children will understand at an early age that the Lord loves all of His children regardless of their circumstances or the language they speak. I am happy because I am speaking a language that I love, and I am passing on a part of my fantastic BYU education to my children.